Your nails are considered ‘healthy’ if they are smooth and are uniform in color and consistency. Healthy nails do not have ridges, discolorations or cracks. There are a few simple steps that you can do to keep your nails healthy or get them back into shape if they are unhealthy. My nail care routine consists of 8 simple steps that will keep your nails healthy and visually appealing! Remove all of your polish, if you have any from a previous manicure before you begin. I use 100% pure acetone, which isn’t the greatest for your nails, so that’s why the proper nail care routine helps out and keeps my nails from becoming brittle and cracking. If you do not paint your nails as often as I do, I highly recommend using a non acetone polish remover. Trim your nails, I try to do this once a week. I love a square nail, so I use a Tweezerman nail clipper with a straight edge, to give me the square look before I even file. If your nails are hard (toes or fingers) you can soak them in warm water with a teaspoon of salt to soften them before cutting. If you are prone to breaks or cracks when trimming, I would moisturize your nails first which will help prevent any breakage while you’re trimming. I know I am going to get some heat for this one, because most everyone, including the experts do not recommend that you cut or push back your cuticles because you can damage your nail bed and increase the chance of infection. After the nails have been trimmed, this is where I would suggest filing any jagged edges and uneven lines to give yourself a uniform look. I use a glass nail file, that I picked up at Sally’s for about $2 and I swear by it but an emery board file will work just as fine. I take a nail buffer, it’s a small object rectangular in shape with four sides to it, each with their own step. 1. Nail File, 2. Remove Ridges, 3. Buff & Smooth, and 4. Polish & Shine. I use steps 2-4 on this nail buffer, skipping only the file because I have already done my filing with my glass nail file. Wash your hands in luke warm water and a gentle hand soap. Use a nail brush to remove any dirt that has built up underneath your nail. MOISTURIZE!! Moisturizing your nails is super important, especially after washing your hands. You should always be in the habit of using a hand moisturizer after your wash your hands and rub some onto your nails. Healthy nails require moisture, so you want to make sure your are giving it to them. I moisturize twice a day (morning and night) with a cuticle cream and nail strengthener, plus my regular hand lotion that I use throughout the day. (Optional) Pour some white vinegar onto a cotton ball and wipe down your nails, this will remove any oils or dirt that may be left over and will get you ready for polish. I use this before applying any polish to my fingernails. (Optional) Protein! I always use a protein treatment and apply it my nails before using any polish, to help keep my nails strong underneath the polish. If your nails are mostly healthy you can skip this step and go straight for your polish. Other things to keep in mind drinking more water and eating leafy greens will help to keep your nails healthy as well as help them grow longer. If you’re looking for something to grow your nails quicker and want to add it into your nail care routine, I suggest vitamins such as Biotin or Prenatal, which will also promote hair growth, so it’s a win win for everyone. Everyone loves having beautiful nails and hands. Nail’s shape, it’s strength, and it’s look reflects your persona in a way and shows how hygienic and self-caring you are. Unfortunately, our hands come in contact with many things which mar the beauty of our nails. 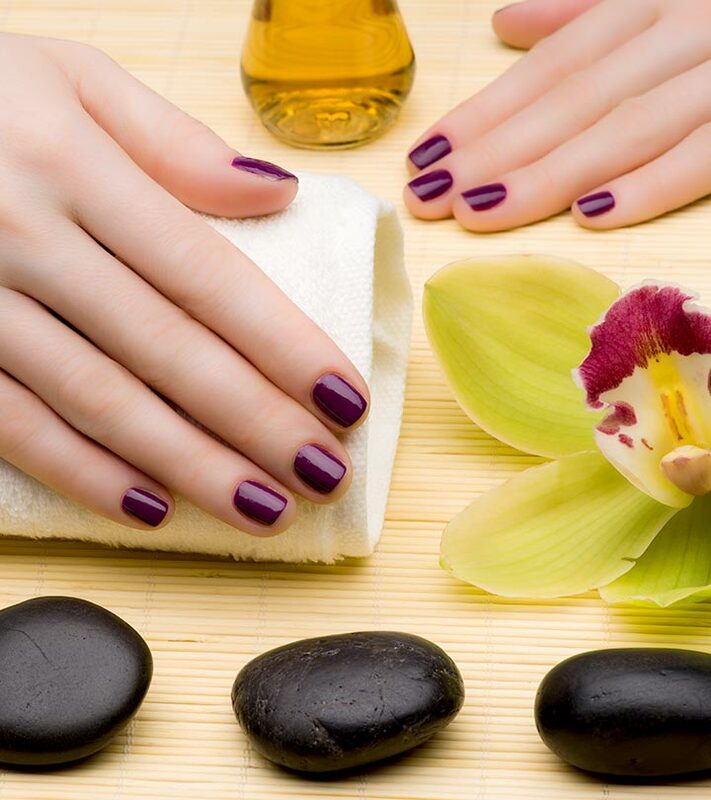 In order to maintain the beauty of your hands, you should follow a specific care routine according to your need. We hear and read a lot about how to do manicures and pedicures and various other techniques to maintain beautiful nails, today let me tell you a little more in depth about how to get beautiful nails that are also strong. Here are a few tips and tricks to keep your nails and hands always beautiful. Make your nail polish last longer by using vinegar. Yes! Just take vinegar on cotton balls and swipe it on your unpolished nails and then apply nail polish. By doing this, your nail polish will stay longer on your nails. If your nails are becoming yellow, give them a chamomile bath. It is very helpful. Add a few spoons of dry chamomile blossom (you can get these from stores that stock aroma products) to two cups of water and brew it for 20 minutes and then dip your nails in it for 15-20 minutes . Do it three times a week and combine it with lemon juice rubs for better results. For brightening your nails, use rose water combined with glycerin and hydrogen peroxide. Mix 40 ml of rose water with 10 gms of glycerin and 50 ml of 3% hydrogen peroxide, and rub it on your nails using a cotton ball drenched with this mixture. To make your hands silky soft, use jojoba oil, and you can use aloe extract to heal the cracks which you may get during cold weather around your cuticles. Nails are 10 times more porous than the skin surface of our body and hence more prone to breakage. So every time you use soap or water in your hands and if your nails are really soft and brittle, it’s best to use some hand cream on your nails too, so that they remain hard and strong. If you want speedy growth of your nails, use gelatin. Gelatin helps in boosting the nail growth. You can also use a basecoat having gelatin as its main ingredients under your polish. Are your nails splitting? This could be because of calcium deficiency. For this, you can add calcium-rich food in your diet. You can also boil eggs and use their shell powder (3gm) daily in your breakfast by mixing it with milk or curd. For proper cuticle care, don’t forget to use cuticle oil daily. Use this oil twice a day to get healthy cuticles and beautiful nails. Cuticle oil or cream specially formulated to keep nail cuticles healthy is a good investment. 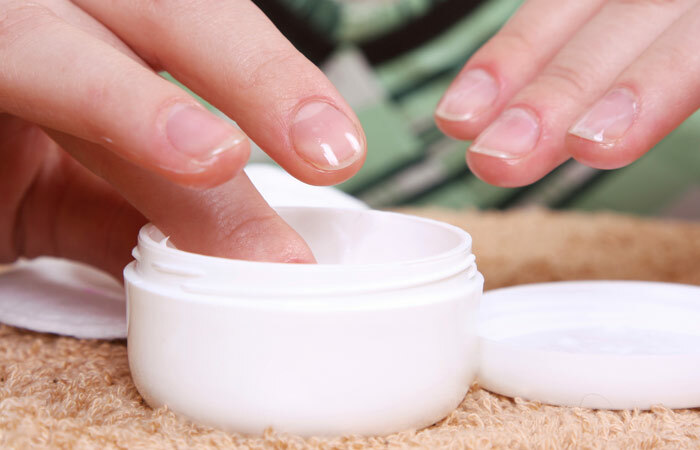 Use nail strengthener conditioners with CF Formulas Hydrating Creme Masque as a conditioner. They are fabulous in keeping your nails healthy and strong. File your nails in one direction only. Use a 240 grit filer if you want to file your nails and don’t use metal filers as they are harmful for your nails.Do not forget to buff, again do not buff too much if your nails are soft. Wearing nails having sharp edges are more vulnerable to breakage. It’s best to grow nails faster about 3/8ths and have them rectangular with rounded edged so that they stay on and don’t break easily. The remover that you use for removing your nail paints can play a major role in making or breaking your nails, i.e., to say that you should use removers of popular brands and invest in them will help you save your nails from breakage. Read the labels before buying any remover and always use an acetone-free formula based nail polish remover. As it is very harsh to your nails, acetone dries out the nails and thus damages its surface. By following a good nail care routine, you can get beautiful nails and hands. But the beauty of your nails doesn’t just depend on your nail but also on the nail polish and how to take care of it. Bubbles look ugly in the nail polish, so to avoid them don’t shake your nail polish bottle. Instead, roll it in between your both palms and then apply it on your nails. Never forget to start your manicure by applying the basecoat. Basecoat protects your nails from discoloration and forfeits them with necessary ingredients. Choose your basecoat according to your requirement. Never apply your nail polish in thick coats. Apply your polish in two thin coats. It will make your polish dry faster with fewer smudge marks and it also prevents chipping. As thicker coats take a lot of time in drying and they also chip fast. To avoid chipping faster, the first measure is to apply your nail paint in thin layers as discussed above. Second measure is to paint the top edge of your tip and also paint little on the underside of the tips. This way your polish does not chip and you can enjoy your manicure for longer. This step is very necessary to have a clean and beautiful manicure. Clean your cuticles by dipping a Q-tip or flat nail brush into nail polish remover. Also, if you smudge your polish or make a mistake dip your Q-tip or brush in remover and amend the mistake. This is also very helpful in case you chip the nail and don’t have enough time to paint your nails again, for this just use your brush dipped in remover to wipe off the nail paint from the tips and repaint them. At least give one hour to your new manicure to dry completely. Also don’t use dry heat like blow-dryer to dry your nails. If you want to make your manicure look more glossy and professional, use high shine fast drying top coat. Top coat not only gives shine to your nails but also prevents chipping and color fade thus long life of your nail art. If you want matte finish, use matte topcoats. When your nails are dry enough to touch, apply cuticle oil and it will further prevent smudging and moisturize your cuticles. Also, keep in mind that what goes in shows out, i.e., to say diet plays a very important role in having good nails. So, if your nails are somewhat brittle and break easily then it may be because you lack some or most of the important elements needed to be included in your diet to make your nails healthy. You should have food that has a good content of biotin(improves the strength of your nails), zinc, magnesium(essential to various functions of cell synthesis), calcium(great for nails as well as bones), iron, and also drink lots of water to keep the toxins out of your system. In the end, I would love to say “HAPPY PAINTING” and follow these tips for beautiful nails.